Joel Embiid slogged his way through 24 forgettable minutes on his bum left knee in the series opener. Only the Golden State Warriors managed to win there on Saturday in a rough day for the higher seeds. Both No. 2s lost, and the Brooklyn Nets won the game and the crowd in Philadelphia, where home fans turned on the third-seeded 76ers during an ugly performance. The 76ers will try to straighten things out when they host Game Two on Monday (Tuesday, Manila time), and the Warriors will try for more smooth sailing against the Clippers at Oracle Arena in the only other game scheduled. The Nets got the surprises started right from the very first game of the postseason when they beat the 76ers, 111-102. Things couldn't have gone much worse for the Sixers, who couldn't quiet Brooklyn's guards or their own fans. The booing started early and grew stronger as the game went on, with Philadelphia All-Star Ben Simmons critical of the fans after being held to nine points while counterpart D'Angelo Russell had 26. "We know that Game Two will definitely be a lot harder for us," Nets guard Caris LeVert said. "We're ready for the challenge." "Every game is different too," Stephen Curry said, "so who knows what will happen Game Two and beyond." KEEP AN EYE ON: The benches. Philadelphia may have one of the best starting fives in the NBA, but there's going to be an awful lot of pressure on the starters if the bench gets blown out as badly as in Game One, when the Nets' reserves had a 59-28 scoring advantage. 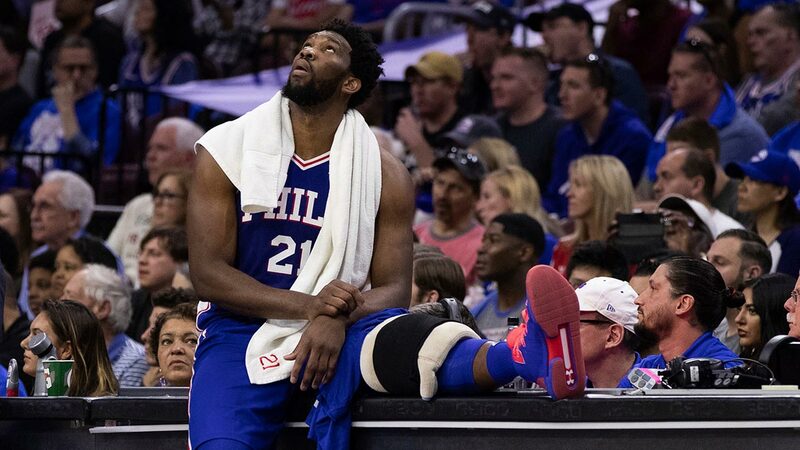 INJURY UPDATE: Joel Embiid is listed as questionable after he was doubtful on the eve of Game One with his sore knee. Nets veterans Ed Davis (sprained right ankle) and Jared Dudley (tight right calf) are being listed as questionable, though Davis said he expected to play after finishing with 12 points and 16 rebounds in the opener. "I don't need to say anything to DeMarcus. It was a frustrating night for him, fouling out, a couple tough calls," coach Steve Kerr said. "But it was important for him to get his feet wet and feel the playoffs, feel the energy, and I have no doubt he'll come back and play a lot better in Game Two."